How does a project fit in with school life? In Year Six classes, a YPPT project will make a great contribution to the Year Six curriculum, as well as covering the end of year performance. A project covers most of the curriculum’s requirements for Art and Design & Technology, and can also form part of the year's English and Maths work, with potential to expand into other subjects according to the teacher's plans. In the videos here, Amanda and Hannah talk about how they were able to integrate the project into their classes' other work. Over the course of the project, each pupil will design and make a marionette, using drawing skills, clay, paint, wood and textiles in the process. Once the puppets are made, the group will move on to designing and painting the backdrops, and designing and making the props. The pupils will also design and produce the programmes and posters for the performances. 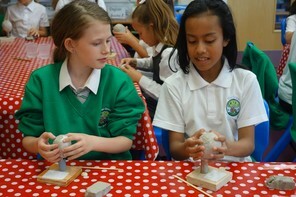 Overall, these activities cover almost the entirety of the Year Six Art curriculum, including aspects of drawing, painting, printing, sculpture, ceramics and textiles. The project also covers most of the new Design and Technology curriculum, including the use of mathematics within design (but with the obvious exception of the new curriculum's cooking requirements!). Our secondary school projects can also be well-integrated with the Art/Design & Technology curricula for KS3 and GCSE, or run as an extra-curricular project. ll YPPT projects supply a script and, although only about one third of the class will have speaking parts, the entire class will have learned the script by heart by the time of the performances. Away from the script, there are huge possibilities for using the project in the English curriculum. 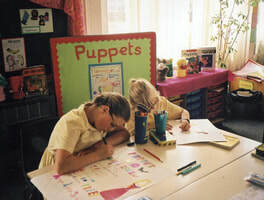 For example, as well as designing and making the programmes and posters for performances, we encourage teachers and classes to make wider use of the project, for example writing instructions on how to make puppets, writing a weekly puppet blog, working with the story to think about the characters' emotions and reviewing the performances (a task that could also be given to younger classes to interest them in the project). Some classes involved have also used computing and IT skills to produce and edit a video diary of their project. The technical requirements of the projects also involve a certain amount of maths, such as in scaling for props and sets. Our stories can also be used in History and Geography lessons, as our scripts come from many places around the world. We are always happy to work with teachers on integrating the project into other lessons.